Two populist and stridently anti-European Union parties surged in Italy’s parliamentary election at the expense of the country’s traditional powers, but neither attracted enough support to govern alone, near-final results showed Monday. With no faction winning a clear majority in Sunday’s vote and the leaders of the rival populist parties both claiming victory, the election was expected to produce a hung Parliament and long, fraught negotiations to form a new government. “Ungovernable Italy,” read the headline in La Stampa daily. The Milan stock exchange closed down .4 percent, with the Mediaset media company of one of the election’s biggest losers, three-time Premier Silvio Berlusconi, down 5.5 percent. According to the results released by Italy’s interior ministry, a center-right coalition that included Berlusconi’s Forza Italia party and the anti-immigrant League won about 37 percent of the vote. The anti-establishment 5-Star Movement came in second with 32 percent. The center-left coalition that has governed Italy since 2013 trailed badly at 23 percent. In an upset, the populist and right-wing League party led by Matteo Salvini surpassed the longtime anchor of the center-right, surpassed Forza Italia. The League captured around 18 percent of the vote, while Forza Italia had less than 14 percent, according to the ministry’s results. A triumphant Salvini celebrated the victory of the center-right bloc, saying it had won the “right and the duty to govern.” He said his party would lead that effort, with Berlusconi as coalition partner. The two met Monday at Berlusconi’s Milan residence, where the three-time premier congratulated Salvini, Forza Italia said. “I am and will remain a populist,” Salvini said. He repeated his belief that joining the common euro currency was a mistake for Italy, but said financial markets shouldn’t fear his party’s leadership. The League leader’s suggestion that the election had produced a clear path to putting him in the premier’s office was challenged by the rival 5-Stars, the highest vote-getter of any single party. The movement’s leader, Luigi Di Maio, immediately asserted his right to govern Italy. 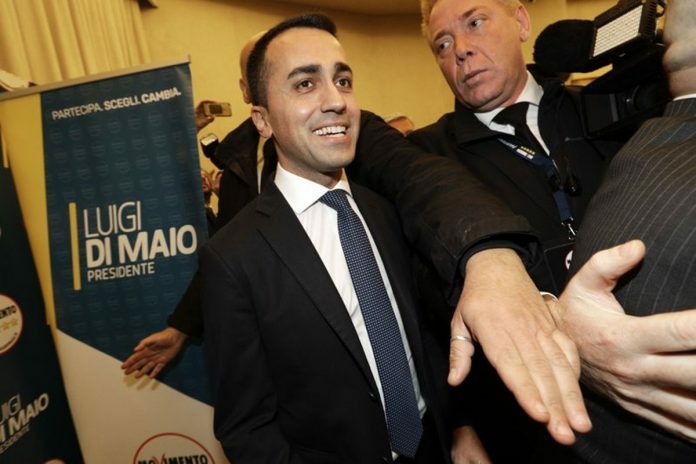 Di Maio noted Monday that no campaign bloc had obtained a majority and said the 5-Stars had strong showings from north to south, even though their main victories were in the south. Besides confirming the upswing for populist, right-wing and euroskeptic forces in Europe, the election verified the weakened status of the two political parties that have dominated Italian politics for decades — Forza Italia and the center-left Democrats. The election results were a stunning loss for the Democratic Party, the main partner in the current center-left government. The Democrats received 25 percent of the vote in 2013. Former Premier Matteo Renzi announced he would resign as Democratic Party secretary after the new government is formed. For now, he excluded the possibility of the Democrats joining any government led by the League or the 5-Stars. “It’s a total defeat,” Renzi said. Political analyst Wolfango Piccoli said the center-right is best positioned to form a government, expected to secure 250-260 seats in the 630-member lower house. Still it will fall short of the 316 needed to control a majority. “The vote has radically transformed Italy’s political landscape and its repercussions will be long-lasting,” Piccoli, the co-founder of the Teneo Intelligence consultancy, said. The negotiations to form a coalition government would be “prolonged and the outcome uncertain,” he said. The 5-Star Movement considers itself an internet-based democracy, not a party, and views established political parties as a parasitic caste. Since its birth in 2009, the 5-Stars have attracted legions of mostly young Italians who are facing few job prospects and are fed up with Italy’s traditional politicians. The 5-Stars had a remarkably strong showing in the south, which has long been a stronghold of the center-right and Forza Italia. During the campaign, Di Maio backed off early 5-Star policy to push for a referendum to get Italy out of the shared euro-currency group. But 5-Star members, who espouse a range of ideology-defying pro-green, anti-bank views, rail against what they say are excessive EU rules. “In all these years we have been going against the current. Now we are starting to fly,” marveled Davide Casaleggio of the 5-Stars. It will now be up to President Sergio Mattarella, a constitutional scholar, to sound out the political parties to determine who has the best chances of forming a government. The League, which only captured 4 percent of the national vote in the last general election in 2013, was particularly strong in the north, its traditional base. In Veneto, where it won 11 percent in 2013, it captured around 33 percent this time around. Salvini, who never has held public office in Italy, fed public anger at the EU’s inability to help Italy handle the hundreds of thousands of migrants who have flooded into the country after being rescued while crossing the Mediterranean Sea. He had vowed during the campaign to expel 150,000 migrants in his first year, but said Monday that the League’s strong showing was due more to its economic proposals than its anti-migrant stance. The League has proposed overturning pension reforms, introducing a flat tax and cutting bureaucracy. “While some were doing anti-fascist marches in the absence of fascists, we were preparing the future,” Salvini said. Still the anti-migrant stance proved popular. The League surged to more than 20 percent of the vote in Macerata, where a former League candidate shot six African migrants in the election campaign. The League didn’t even reach 1 percent there in 2013. Between the League and the 5-Stars, the results showed that the two parties with the most euroskeptic platforms together topped the 50 percent needed to rule Italy. While the two are rivals, if they joined together, analysts have called that a “nightmare scenario” for the European Union and the financial markets. Salvini said he would begin sounding out any other potential allies to reach the necessary parliamentary majority, but he ruled out any “strange coalitions,” an apparent reference to a possible alliance with the 5-Stars. “No, no, no,” Salvini said when asked about the possibility of governing with the 5-Stars.